To discuss, or to order any of the various styles, materials & designs of coffins that may be used at the Natural Burial Ground please telephone us on 01993-878387. 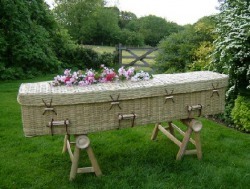 Bio-degradable wicker coffins are available from approx. £600.00 and cardboard coffins from £295.00. Please note that coffins must comply with the ANBG Code of Practice.